In a large pot of boiling salted water, cook the fettuccini pasta until al dente. Drain and toss with 1 tbsp. of olive oil. In a large skillet on medium high heat, add chopped bacon and cook until slightly crispy, remove and set aside. Add 1 tbsp. of olive oil to the skillet and add diced onions. Sweat then add minced garlic and wine if desired. In a small sauté pan warm the scallops and sauce as per instructions. Return bacon to skillet with the drained cooked fettuccini. Toss. In a small mixing bowl, beat egg yolks, slowing add Garlic Cream sauce and continue to beat fast. Do not let the eggs curdle. 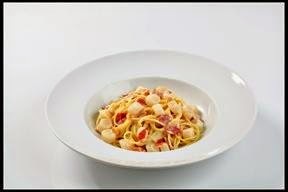 Add the egg mixture back to the Clearwater Garlic Cream Scallops & Sauce and stir into Fettuccini. Stir in the Parmesan Reggiano, green onions and butter. Season to preference and enjoy. activists who came to the forefront of the Canadian culinary scene in the early '90s. Australia where he won Bronze. Growing up in rural Nova Scotia,he was a wild food forager at a young age. focus on sourcing local food, Stefan opened his nationally--‐acclaimed restaurant, Seasons in Thyme in Prince Edward Island in 1993. It was awarded three stars from “Where to Eat in Canada” and Four Diamonds from CAA/AAA. frozen--‐at--‐sea scallops. As a firm believer of “fresh is best”, he was leery of trying the frozen product. ability to perfectly sear every time. For Clearwater and Chef Stefan, it’s been a match made in heaven ever since.